One might think there isn’t too many destinations in Europe which remain cool enough for climbing during the summer months. Whereas many crags in Southern parts get too warm there’s luckily plenty of suitable options left for summer climbing. Create your free account to 27 Crags and get one week access to hundreds of complete guidebooks, Céüse, Bohuslän & Magic Wood included! Here’s a list of great destinations both for boulderers and sport climbers (+ one amazing trad spot!). Enjoy! Diamonds in the inside 6c. Photo by Laurent Girousse. Céüse sits around 2000m/7000ft high with an equal amount of sunny and shaded areas to deal with a variety of temperatures. Many of the climbs are long and some would consider the bolts run out, so be ready! It’s a long approach so many climbers stash their climbing equipment near their project. Accommodation: Les Guernis campsite or caravans. There is are also the more luxurious options of hotel Muret in Sigoyer or one of the numerous "gites rureaux"
Comparable to Yosemite, but virtually empty and located by the sea, Bohuslän is said to be a trad climber’s paradise. With a variety of grades to choose from, the rock quality is exceptional and the landscape is beautiful. Just like the rest of Scandanavia, Bohuslän is not cheap, so stock up in the bigger cities. When to go: Spring or Fall, summer possible. Fees/Permits: No but most of the crags are on private land so remember to behave. Magic Wood boasts some of the best quality bouldering rock in the world in a damp, yet “magical” forest of moss, trees, rocks and a beautiful river. The landings are sub par and hiking can be treacherous if you don't pay attention. If you go in late August and have time to stay, you might be able to sample some of the incredible bouldering in Ticino at the base of the mountain as well. What else to do nearby: Visit Chur, Bellizona, or any of the other nearby Italian towns for history, art, beauty and great food! Lofoten is one of the most beautiful and unique landscapes in Europe- iconic Fisherman’s houses line the coast and soaring green mountains cover the land. While expensive and not the easiest to get to, the incredible beauty of this place is worth a trip in itself and the climbing is new enough that it is still in its development stage if that’s your thing. The weather is definitely inconsistent so it is best to keep this in mind. Despite its reputation as the home of many of the hardest lines in the world, Flatanger also offers a plethora of climbing for other levels. Sitting beside a fjord, this picturesque rope climbing destination is truly world class. Come for the Flatanger Climbing Festival in June! A beautiful alpine granite area of lush greenery unlike any other climbing area in Spain. It is part of the Natura 2000 network and Biosphere Reserve and there are strict rules that need to be followed in order to keep the place as pristine as it is. A few of these main rules are no fires, no tents, no disturbing the cows and no trash left behind. The area sits at 2050 meters above sea level so be weary if you get altitude sickness. Hoya Moros is unlike most European bouldering destinations because you feel so far away from everything and everyone. Where to stay: Camping at the top but no tents allowed- sleeping bags and bivvy spots, be prepared to bring everything you will need and more (except water- just bring a filtration system). The approaches here are short, unlike typical Alpine areas, and with the pristine and lush landscape of meadows and forests, this is a paradise for rope climbers. 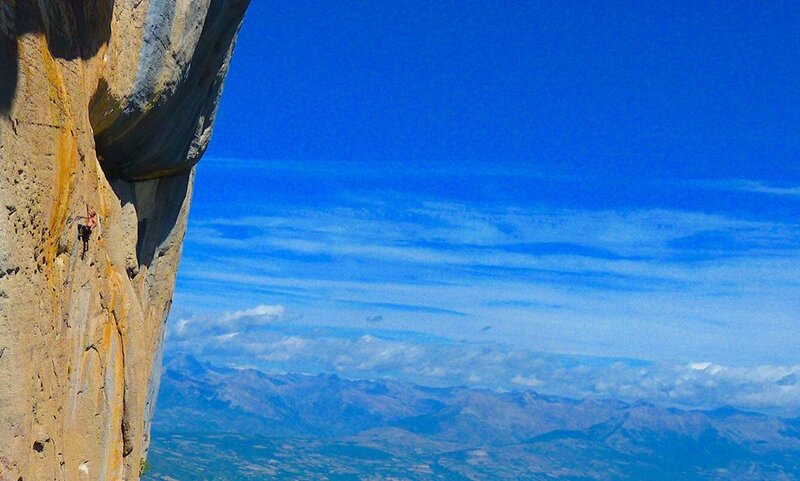 Famous for via ferrata and mountaineering, climbing has a long standing tradition in this area of the world. There is a fantastic mix of single and long multi pitch climbing here, so there is something for everyone. Where to eat: In any of the nearby towns. Cooking yourself.